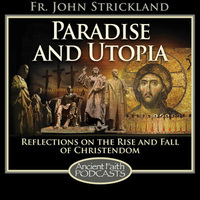 In this episode Father John concludes his reflection on the critical state of western Christendom on the eve of modern times, exploring how the Reformation tried to resolve the issue of anthropological pessimism but ironically served to intensify it. In this episode Fr. John explores the life of Protestant father John Calvin and the reformer's contribution to the Reformation project. In this episode Fr. John discusses ways in which Reformed cosmology represented a shift from the heavenly immanence of paradisiacal Christendom toward the heavenly transcendence of utopian Christendom.